Buying running shoes is a big decision. This is why we are happy to offer a 30-day risk-free trial on all Topo models (excluding Final Sale items). If after 30 days you don't love the comfort and freedom of Topo's natural fit, don't worry, we've got your back. So go ahead and give them a try. Your feet will thank you! Light, breathable, and flexible for a comfortable natural running experience. Explore the origins and inspiration behind the Topo brand and learn how we express our mission through the products we make and people we serve. Buying running shoes is a big decision. This is why we are happy to offer a 30-day risk-free trial on all Topo models. The Rekovr will maximize your recovery days with a feature set designed to stimulate and restore a fatigued body though movement. The wool blend upper delivers moisture-wicking comfort and the OrthoLite® footbed provides gentle neural stimulation with its raised 3D-wave pattern. The 22/19mm platform sits on a lightly lugged sole for activities like walking, light hiking, travel, and casual use. The Rekovr is meant to be worn without socks, but if you plan to wear socks with this model, we recommend sizing up by one half size. 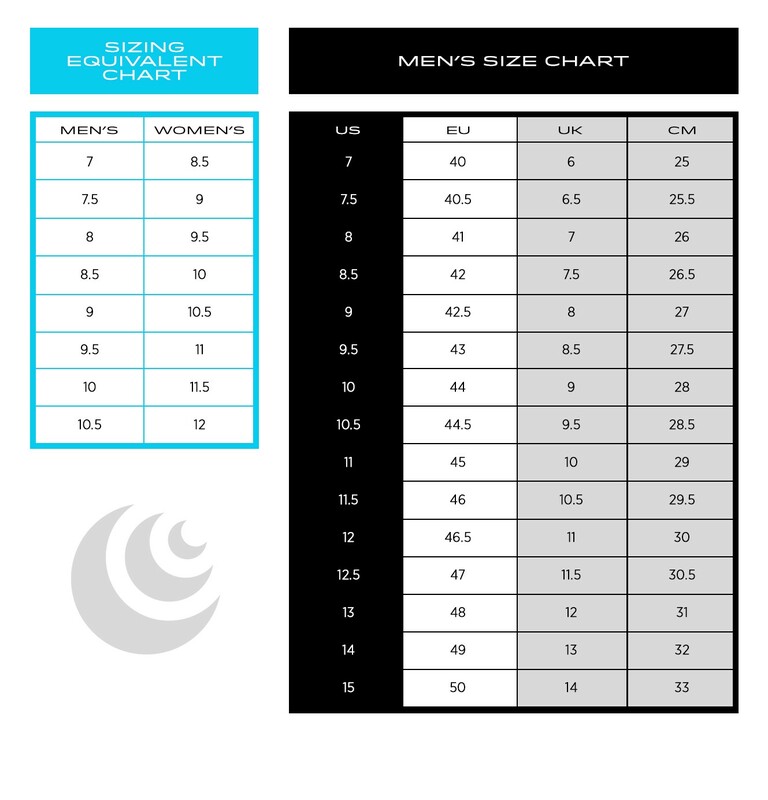 Stack height refers to the total height of materials (midsole + outsole) underfoot. Drop refers to the height difference between heel (midsole + outsole) and forefoot (midsole + outsole). Anatomical toe box allows toes to spread naturally and comfortably. Combines multidirectional traction, heel braking lugs, and mud/snow release design features. 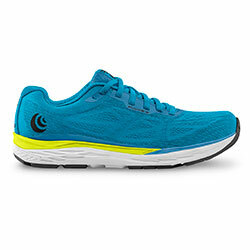 Our mid-level drop provides a near neutral platform for a more natural running experience. The Rekover is just the ticket. They fit like a glove, cradling my feet like bugs in a rug. The uppers, comfortable right out of the box, soften up to bring even more comfort. The insoles make my feet smile. I wear them teaching all day, and I forget I have them on. I love the Topo fit (all my running shoes are Topos), and the Rekover, for me, is the best fit yet! Plus they look sharp. I like these shoes for the most part. I run in a pair of Fly-Lite 2 and the M-Rekovr have become my everyday shoe. However, the M-Rekovr is designed to wear without socks. Initially I went without socks, but after a couple of days my feet broke out in a rash. Thinking it might be an old pair of shoes, I threw them out. The rash cleared up, so I went back to wearing the M-Rekovr without socks. The rash returned after only wearing this shoe on two consecutive days of rest. I don't know what it is about this shoe, but I suggest people that may have sensitive skin wear socks with this shoe. It's possible that it could be the wool blend affecting my feet, but every winter I wear Columbia wool socks and never have a problem. As a triathlete, I was happy to learn about Topo's Rekovr for post workout or recovery days. The ortholite footbed is extremely comfortable and I have no difficulty wearing these shoes without socks. The velcro strap makes for easy on and easy off which I really like. As a person who tends to have stinky shoes, I must say the wool blend of these truly does seem to minimize any odor build up. I am a Topo Ambassador, but my review is 100% true to my experience. These shoes are great. As a Topo ambassador, I was more than excited to get my hands (err, feet) on these. This shoe is ridiculously comfortable. Like you won't want to wear anything else comfortable. The ridged Ortholite insole is like a constant massage for your feet, especially when wearing barefoot. 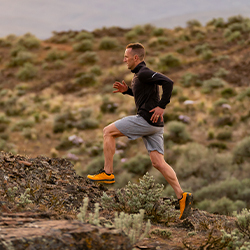 The midsole has plenty of cushion and support, so walking around after a long run is comfortable, and a trail outsole lets you take it on the trails. As for fit, unless you're wearing thick socks, I don't feel that you need to size up. If you're planning on wearing it with thick winter socks, then a half size up makes sense. My favorite non-running shoe! I bought my Rekovr shoes 3 months ago - have worn them with and without socks almost exclusively since then. I add socks when temps drop to single digits/low teens. I have 3 pairs of shoes now: insulated winter boots, Rekovr and MT-2. The Rekovr is a great looking shoe - even going out to dinner. I credit my Topo shoes with having relieved and corrected plantar fasciitis from last year. Add to that the fact I have a bunion on my left foot - which has always been the blowout point for all other shoes - and Topo wins again with the roomy toebox. I run about 1,000 miles of Wisconsin trails a year with my dog Newton, so the MT-2s get plenty of testing. I only have one gripe with my Rekovr: the inner lining in the heel has completely worn out on one foot, and is going fast in the other (at 3 months use) - correct this with something more durable and it’s a 5-star-PLUS review! I've had these shoes for about a month, and I wear them all of the time at work (teaching) and have used them as a camp shoe as well. They are super comfortable, breathable, and with the wool, they are usually not too hot or cold. I don't wear them without socks...maybe if they were merino I would. I also didn't size any differently and can wear a light sock, no problem. I still am not sure if I love/hate the way they look...but they are so comfortable, I don't spend much time thinking about it. It would be sweet if the heel folded down so you could use them as a slip-on as well. This is the best shoe I have ever worn in my whole life. My foot is at its widest at the toes and this shoe gives me the room I need. It is so comfortable. I wear it with orthotics and they do not squeak in the shoe unlike most shoes including some of your other models. It appears that this shoe can do any activity, which I will test out shortly. While it’s a good shoe, I don’t like it as much as the lace up models. It’s hard to put on after I put my orthotics in, and not as stable as the laceups. I bought them to wear with casual outfits and not be so noticeably a sports show. The black sole and absence of laces gives it a little dressier appearance. I have to wear this kind of shoe as my feet are crippled with arthritis and very unstable and Topos give me lots of toe room, which I need. They are all wonderful shoes, and just about the only ones I ever wear any more. 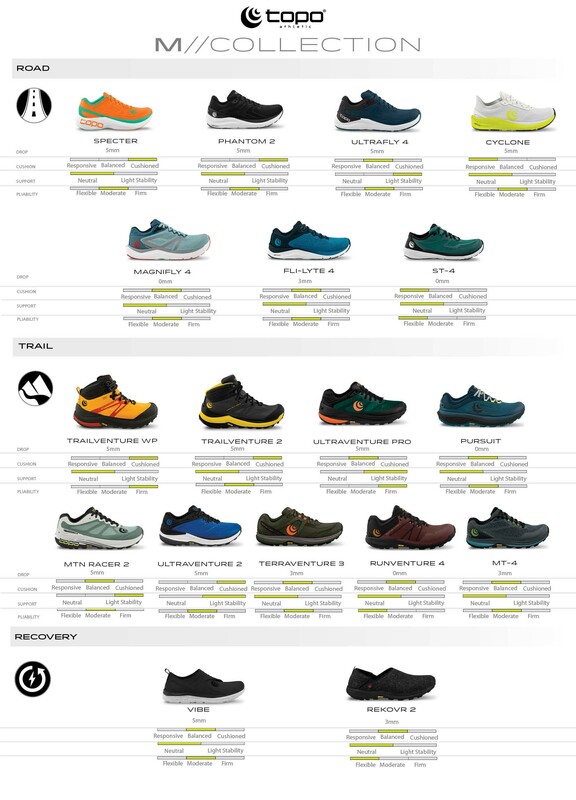 My feet are more stable and feel better in Topo shoes than any others I have tried, and I literally have tried dozens and dozens, if not hundreds, in the past few years. Ultralight materials and seam-reducing construction techniques keep weight down and blisters at bay. Plenty of room for the toes to spread and splay. A secure fit through the heel and midfoot allows the shoe to move with your body. Topo cushioned midsoles are engineered with a 0 to 5mm heel-to-toe drop, encouraging natural loading and foot motion during the gait cycle. 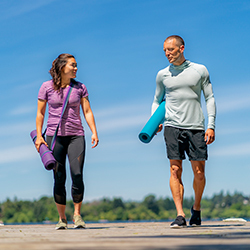 © 2019 Topo Athletic Inc.
Be the first to receive news from Topo Athletic, including new product announcements, back in stock notifications, and promotions. We don’t sell or share your information and we never SPAM.